Nearly every musician has a childhood memory about how they fell in love with music. It was the sound of their mother playing piano, or a distinct afternoon in kindergarten listening to Beethoven’s “Pastoral” Symphony No. 6. Mine is of my first performance with my tiny hometown’s community orchestra (at the age of 13, and having played oboe for just a bit more than a year), which included Schubert’s “Great” Symphony in C Major and Beethoven’s Violin Concerto. Often, there is a direct path of cause-and-effect that has led one to be in a particular place. That concert was the point at which my musical path began. 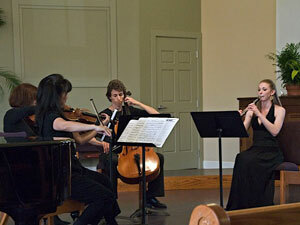 Jessica Perlman (right) with members of the Coastside Community Orchestra presented a chamber music recital in a local church to raise funds for the orchestra. The small but vibrant Coastside Community Orchestra was founded in the town of Half Moon Bay, Calif. (population 10,000), in 1983, by a group of 10 musicians. They connected with each other through an advertisement in the local newspaper and shared a common dream: to organize a non-professional orchestra that would enhance their community. For 25 years now, they have been enjoying the rewards of that achievement. The C.C.O. performs a concert series each year, comprising repertoire ranging from major symphonies, newly composed works, and concertos with local and guest artists. It organizes outreach programs in the schools to introduce children to the instruments of the orchestra and to promote classical music. For many children, this is the first and only exposure to classical music they will receive. Perhaps most dear to the C.C.O. and its mission is its scholarship fund; each year, the orchestra distributes scholarships to young musicians in the community to defray costs of lessons, instrument purchases, and summer camps. In an era when American orchestras are in dire need of support, and many smaller ones struggle to stay afloat, it is miraculous that the C.C.O. not only exists, but finds it imperative to give back to its own community. When I was in middle school, I received one of these scholarships; at that time, I could have never imagined that, as a future Juilliard graduate student, I too would be able to give back. Last spring the orchestra fell into a financial quagmire, its longtime director and conductor, Kay Raney, having fallen extremely ill. For years Mr. Raney had donated his time in innumerable ways towards the orchestra, managing everything from the music library to program notes and ticket sales. With his illness, the orchestra board found itself scrambling to reallocate duties, often forced to hire outside help. Upon hearing this distressing news, I knew that something had to be done—and that I had the power and obligation to help the now-struggling little orchestra that gave me my first beautiful and inspiring orchestral experiences. I decided to give a recital in Half Moon Bay to benefit the Coastside Community Orchestra—in particular, its scholarship fund. I applied to the Juilliard Summer Grant program and received a generous stipend to help offset the costs of putting on the performance. In planning a benefit concert, one must work as hard as possible to solicit donations beforehand. I scheduled the concert in a local church that supports the orchestra by deeply discounting its hall rental. My accompanist, Lisa Spector (a graduate of Juilliard), also reduced her usual fee. I visited local food and beverage vendors, receiving donations from nearly half a dozen bakeries, stores, and cafes. Members and friends of the orchestra helped design and distribute flyers. All these donated services and goods saved us around $700. Perhaps most helpful in advertising the event was an article in our local paper, the weekly Half Moon Bay Review. I contacted them straightaway, and an article about my musical story, the orchestra, and the benefit recital ran the week leading up to the concert. A significant number of people attended the recital after having seen this article. The day of the concert, I was nervous. How many people would show up? How much money could I raise? I had been rehearsing the program thoroughly with my accompanist and the enthusiastic string trio comprising members from the orchestra. All the refreshments were laid out, tickets were being sold at the door, programs distributed. I had a fantastic turnout of close to 100 people, many more than were expected and all of whom made the church feel warm and comfortable. The concert was received extremely well, and it was a treat for me to play in such a supportive environment, surrounded by people from the community in which I was raised. I had anticipated earning around $600 for the orchestra, but after counting all the money and subtracting expenses, I discovered I had raised more than $1,400. I notified as many orchestra members as I could right away, including Mr. Raney, who was unfortunately too ill to attend the performance. This sum represents a significant portion of the orchestra’s annual budget, meaning the C.C.O. will be able to distribute more substantial scholarships than ever before. It feels wonderful to have helped my community in such a meaningful and lasting way, and it is something I am sure to continue in the future. For all of us artists, no matter where we are on our creative paths, it is important to remember, honor, and give back to the roots of our endeavors. I thank The Juilliard School and the members of the Summer Grant Committee immensely for listening to my story and for supporting my summer project.